Black Brows is a HuMP ('hundred metres prominence') so someone else must have climbed this hill before us. To reach it we followed the dry stone wall from the south through thick forest with a fair amount of climbing over wind-blown conifers. We saw no human footprints. Thankfully, the summit (the tallest of several, very narrow blades of rock) gave us a view. 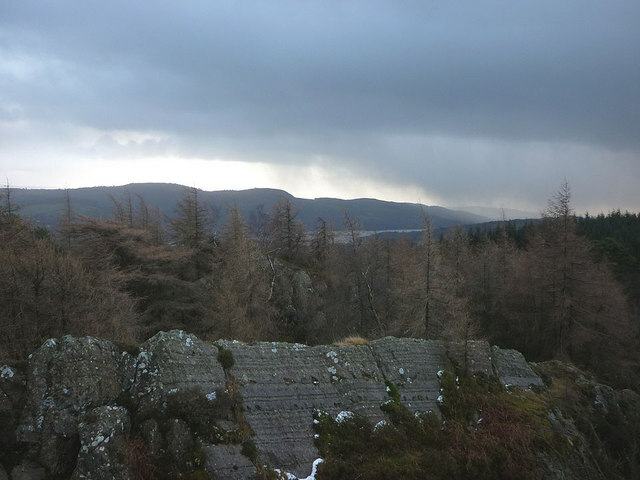 Seen here is a glimpse of Windermere's southern reaches overlooked by Gummer's How. More showers of sleet and rain are being blown in by the strong wind. Our descent towards the north was much wetter underfoot.